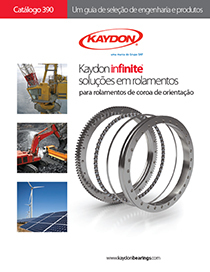 Muskegon, Michigan, USA...Kaydon Bearings has released a Portuguese-language edition of its slewing ring bearing catalog, to better serve its international customers. A PDF version of the catalog may be downloaded from the Kaydon downloads page. Engineers may request a free printed copy; or call Kaydon toll-free at 800.514.3066. The comprehensive catalog includes time-saving tables with updated specifications and dimensions as well as load charts and cross-sectional drawings for Kaydon's extensive line of slewing ring bearings. Also featured are installation and maintenance recommendations, remanufactured bearings information, and an expanded reference guide, including a convenient metric-English conversion chart. The user-friendly PDF version includes links between pages for easy navigation. Both the print and PDF catalogs include a worksheet that can be submitted for a free, customized application review and recommendation by Kaydon engineers.